Settlement by German immigrants occurred in the early 1890s. The site was chosen for the juncture of Sandies Creek with the Guadalupe River. A school for area children was set up on the Wofford Ranch and was called Wofford. But the singing of a popular German song (“Lindenau”) at a school recital resulted in a change of name. In 1895 when a store and post office opened, the name was applied to the growing community at large. 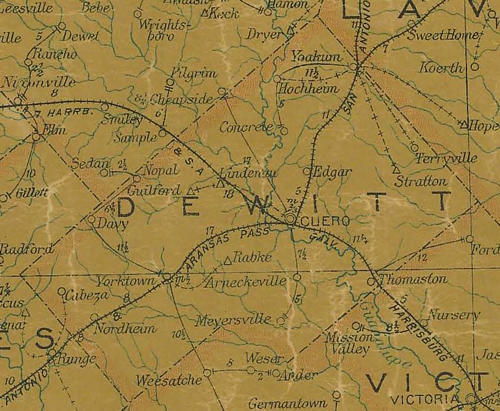 Proximity to Cuero prevented any large scale growth, so Lindenau was content to travel to Cuero for most important business. In 1906 the community moved a mile to get alongside the tracks of the Galveston, Harrisburg and San Antonio Railroad, although the school remained where it was founded. A depot was built and the new community had a cotton gin and the relocated post office. 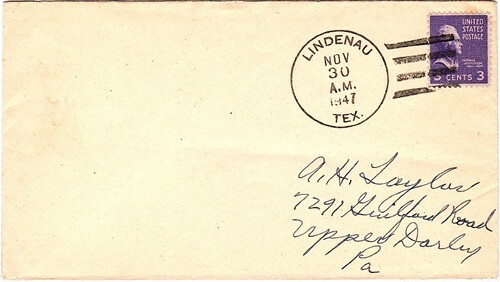 A mix-up in the spelling of the post office’s name resulted in six week period in 1920 of the town being known as Lindeman, Texas. The post office was finally closed in 1948. The school was replaced by a three-story structure in 1930 which was in use through the mid 1950s. For over forty years (1920-late 1960s) the population was reported as 60, dropping to 50 for the late 1960s and it remained at that level for the 2000 census.